It’d be a lie if we said we were tired of hearing about the Drying Lotion. Drying Lotion this, Drying Lotion that – people wax poetic about the little bottle of pink, calling it a holy grail, instant pimple eraser. We love that you love this acne treatment – your testimonials make us happy. But put your Calamine-dipped Q-tips down for just a moment. It’ll be brief, I promise. Give the Special Healing Powder a chance; it deserves just as much attention. We call it our little superstar-in-the-making; you can call it your secret weapon. Keep it handy in your skincare arsenal at all times for fast acne treatment. It’s good, I tell ya. Oily and/or acne-prone skin types, rejoice. 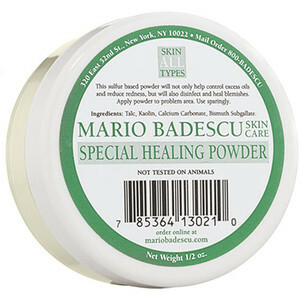 This powder helps heal acne, reduce redness and even out problem areas. With highly oil-absorbent and antiseptic properties, it dries up excess shine while disinfecting and calming for fast acne treatment. It’s one of our most versatile acne products. Apply it on blemishes or ruptured pimples. Or, if you have very oily skin, mix a small amount into your loose powder. And voila! Shine begone. Have you tried this hidden gem yet?